I know you are probably spending a few minutes of each day looking at the growing number of colorful packages under your Christmas tree and fantasizing about what each box might contain. I do the same thing, but this morning I learned that sometimes the best presents don’t have a box or wrapping paper at all. Sometimes the best gifts come in the form of plans, and today the members of Thrice teased plans for the new year. 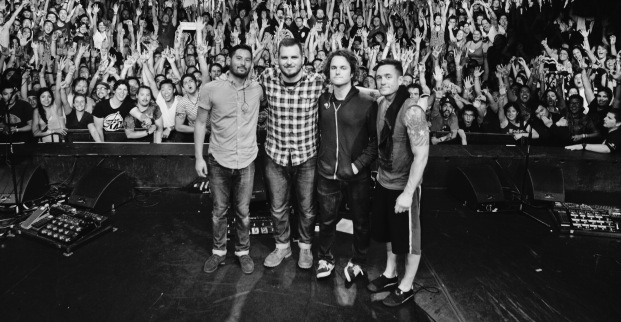 Yes, after a few years of hiatus, Thrice have begun to tease what will likely be a resurgence for the band in 2015. A new image popped up on the group’s official Tumblr page today that features a shot of the band with the words ‘THRICE 2015’ in large print. No additional information was given. You can view the image below. The fact this image showcases a live setting leads me to believe a tour will happen before new music, but at this point it’s anyone’s guess. Follow UTG on Twitter for updates.